The surreal art world exploded with the arrival of Salvador Dalí in Paris in 1926. Calling his paintings “hand-painted dream landscapes,” Dalí painted streams of consciousness, intense feelings and above all, his dreams. 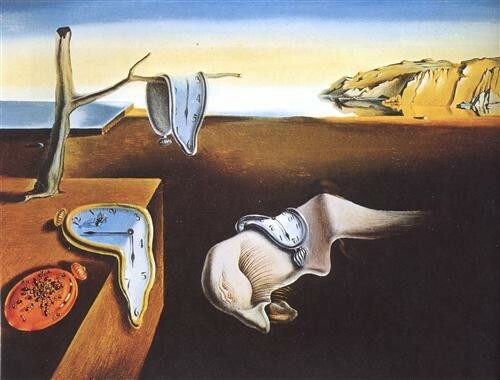 Some art scholars believe that Dalí’s melting clocks may symbolize Albert Einstein’s groundbreaking theory of relativity, a new and revolutionary idea back in the culture of the 1930’s. Through the theory of relativity, Einstein proposed a new concept of time as being relative and complex–not something fixed and easily tracked with as crude a gadget as a pocket watch. Time is melting. 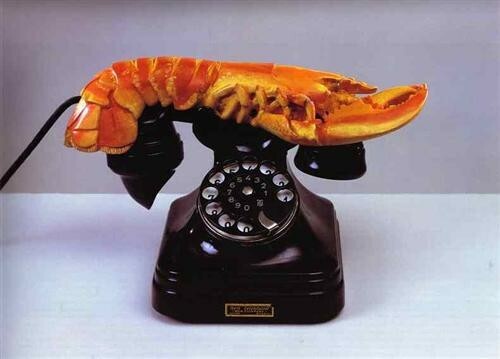 The Lobster Telephone is one of Dalí’s most startling and unsettling creations. The simple placement of two unrelated objects together – a lobster on a traditional phone receiver – turns the everyday device into something surreal, making it strange but fascinating. The telephone works, but would you pick it up?! 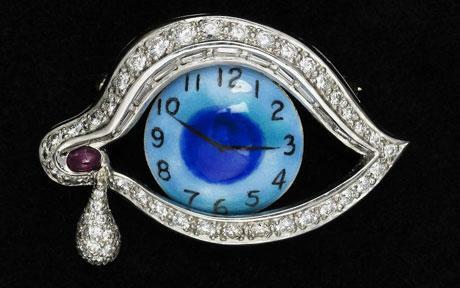 With his wicked sense of humor and desire to baffle his public completely, Dalí designed wildly imaginative jewelry and very fine jewelry indeed. A watch is set with a ruby, diamonds and enamel. The eye is a finely crafted Swiss timepiece. Thank you ! This is wonderful! And Bob is as great as he always was. Please give him my best and my thanks for this treasure! Loved The Dali film and your Eat At Art film. If you get a chance try to see my Homage to Dali image at the Oceanside Museum upstairs. Its there until Jan. 2016. Great videos. What wonderful idea. Merry Christmas, I’m headed to New Zealand for 2 weeks. Keep sending. Kirby, I love that brooch with the watch! Interesting article. Robert Foxworth’s narration of the “Chaos of Salvador Dali” was animated and insightful. It was also inaccurate, inasmuch as he refers to Dali as”…faithful husband….” He does redeem himself somewhat by saying this was “according to Dali”. From my reading of Dali’s biography, it seems Dali was a philanderer of gargantuan, if not epic, proportions. It may be true that Dali stayed w/ long suffering “Gala” for more than half a century, (perhaps it would be more accurate to say she stayed with him!) but he certainly did not stay faithful to anyone but, perhaps, himself, all that time. I must confess I’m an ardent fan of Dali the Surrealist, and he certainly qualifies as a “magnificent oil painter”, but his chaotic lifestyle is neither to be admired nor emulated. This is my favorite one yet! Robert made Dali’s story come to life & what a story it is! Dali’s supreme self-esteem is awesome and inspirational. 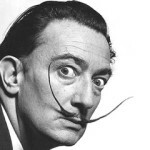 Creative types can take heart from how Dali so valued his central role in society as an artist. Walt Whitman comes to mind as a literary figure that similarly celebrated his own centrality as America’s poet. Your film was wonderful. I am never disappointed by my visits to your blog, Kirby! Thank you again for another wonderful installment.